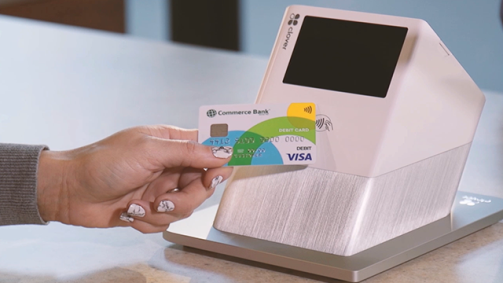 The Commerce Bank Platinum Visa® Debit Card delivers additional benefits to enhance your relationship through existing accounts such as the CommerceRelationship Checking Account. When you pay for lodging with your Visa card, you can be reimbursed for covered personal property that is stolen from your room. Book travel or pay for travel fare with the card, and the cost of both your luggage and its contents can be reimbursed if they’re lost or stolen by the common carrier. Get help coordinating medical, legal, and travel services when you need them. The cost of any goods or services is your responsibility. Enroll in text Alerts in Online Banking to track your spending and monitor for any suspicious account activity. Lock a missing card using Online Banking to temporarily block new purchases and ATM withdrawals, without interrupting your recurring payments. Once you find your card, simply unlock it and begin using it again. You can now tap to pay at checkout counters that support contactless technology. Follow the instructions below to use your Platinum Visa® Debit Card wherever you see the contactless Symbol2 for fast, more secure3 transactions. Existing customers will receive a contactless Platinum Visa® Debit Card after your current card expires.